Below is a list of flowers from the game, where to obtain them and how much they sell for. Flowers have several uses in the game, in addition to selling them for profit. 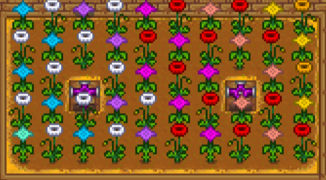 Flowers (along with forage & Tree Sap) are one category of the items scored in the grange display at the Stardew Valley Fair. Flowers (other than Crocus, Sweet Pea, & Sunflower) grown as crops will affect the type of Honey produced by nearby Bee Houses. Sunflowers can be processed in the Oil Maker to produce Oil. Flowers (other than Poppy) are a universally liked gift; all villagers other than Clint, George, and Sebastian like them. Gifting foraged flowers (Sweet Pea & Crocus) can be an inexpensive way to level up friendship. Note that Dandelion and Daffodil are not listed here because they are "Forage" in the game, and not "Flowers." 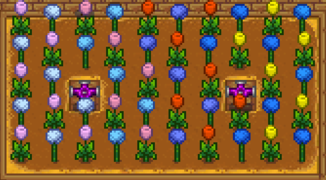 Note also that Crocus and Sweet Pea are not affected by the Tiller Profession bonus because they do not count as crops, despite the fact that they can be grown from Wild Seeds. Although each flower planted has an equally random chance of being one of a specific number of colors, flowers planted in groups often form discernable patterns. This page was last modified on 5 July 2018, at 19:49.